Salary negotiable, plus commission and bonus schemes, 7.5% company pension contribution and 25 days annual leave. 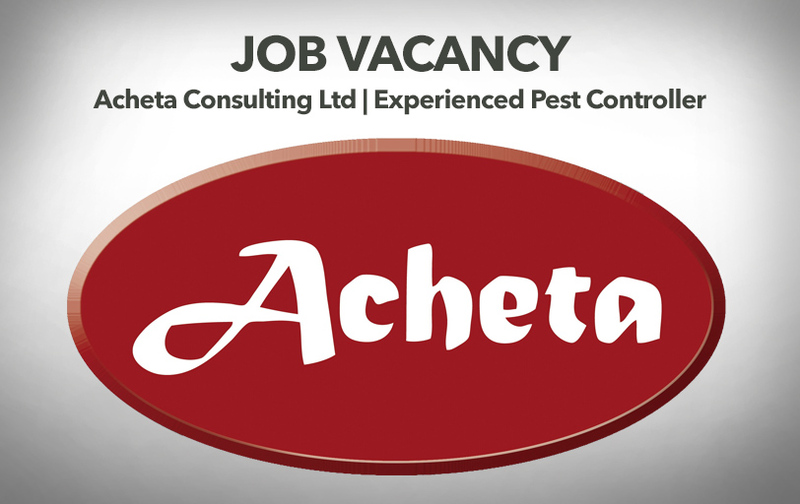 Acheta Consulting Ltd provides independent pest management inspection and consultancy services to a diverse range of customers. We work all over the UK, and internationally, and are looking to recruit experienced pest controllers to join our team. You don’t need to be a field biologist, but should have experience of inspecting warehouses and food-manufacturing sites. We will invest in a less experienced person who shows that they have what it takes to develop. You will work from home, but travel widely. A driving licence and good literacy skills are essential. For a confidential discussion about the opportunities on offer call Ian Adamson on 07852-483080 or Mark Bowron on 07908-575813. Previous articleBlue skies ahead! PestWest USA move to a new head office. Error: Error validating access token: Session has expired on Sunday, 17-Feb-19 03:23:39 PST. The current time is Thursday, 18-Apr-19 22:00:05 PDT.